Earlier today, Dropbox announced the launch of its e-mail app “Mailbox” for Android and MacOSX. While the Android app is already available on Google Play, the desktop app is still in early beta. Orchestra, the company originally behind Mailbox, was acquired by Dropbox about a year ago. Up until now, the app was only available on iOS. It looks like Dropbox wants to push the email client to a new level with launching it on Android and MacOSX. 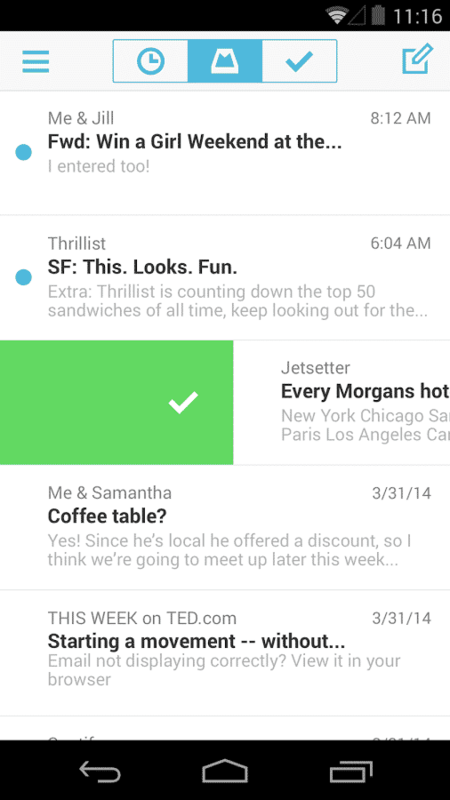 Mailbox wants to clean up your mailbox, make it light-weight, fast & mobile friendly. 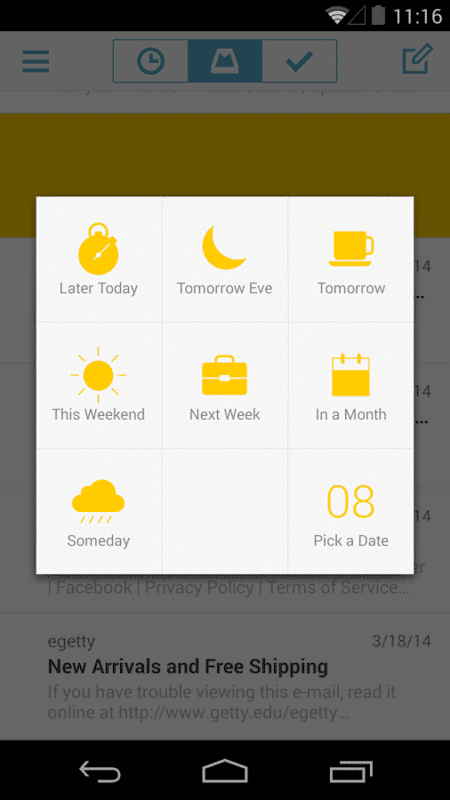 By offering swipe gestures, you are able archive, delete, snooze or add an email to a certain list. Pretty cool. Mailbox also learns from your usage habits and starts to automatically filter your emails. But let’s have a look at the features in detail. Archiving and deleting emails is pretty straightforward. To archive an email simply swipe to the right. To delete it, just go even further to the right. That’s it. Swiping to the left will do two things. Slightly swiping will open the snooze-function which offers eight different reminder settings. Snoozing an email will hide the email from your inbox and bring it back at your selected time or date. If you want to access the email earlier, you are able to see a list snoozed emails via the menu. The app currently only offers Gmail and iCloud support which might be a big no-go for many people. I guess that I’ll stick to the standard Gmail app for now. You are also able to add a email to a list by swiping it completely to the left. Mailbox comes with a few predefined lists such as “to buy” or “to watch” but you can easily add more lists. I’ve tested Mailbox for the past few hours and don’t really like it. I’m using two Gmail accounts and Mailbox is mixing them in one combined inbox. I know that’s a feature, but I don’t want to mix personal with business-related emails. But that might just be me. The app itself also looks like a iOS-port (which it is) and doesn’t really feel like an Android app. I’m not trying to be a die-hard Android fanboy here, but if you port an App from iOS to Android make sure that it fits to Android. I personally don’t like the iOS7 look and don’t want my Android apps look like that. Unfortunately, I don’t have access to the Mailbox desktop client yet, so I can’t give you any personal feedback on that. If you want to test the app yourself, download it from Google Play or sign up for the desktop beta.